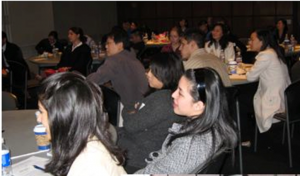 Before ACCP established student chapters, UUCSF NCCCP Student Leaders served 3- to 4-year terms. They are usually appointed during their P1 year, which allowed them time to become oriented to NCCCP and ACCP organizations prior to taking full responsibility for UCSF NCCCP Student projects. UCSF NCCCP Student Leaders took primary responsibility for activities during their P2 year, and moved into an advisory capacity during their P3 and P4 years. 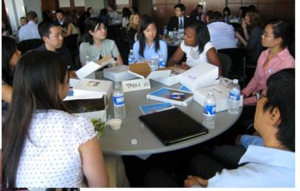 UCSF NCCCP Student Leaders often began serving as ACCP Student Liaisons for UCSF during their P3 year, and they were also eligible to apply for appointment to the ACCP National Student Advisory Board. September 2007 Residents’ Panel Discussion at UCSF, hosted by UCSF NCCCP Student Leaders Wendy Sui and Christine Bang. UCSF NCCCP Student Leaders also managed the venue. March 2008 NCCCP Student Leaders from multiple schools design and conduct Pediatrics event at UCSF, again hosted by UCSF Student Leaders. This was the first NCCCP student program driven entirely by students. September 2008 UCSF NCCCP Student Leaders assist with multi-school Residency Panel Discussion at Kaiser Permanente in Walnut Creek. 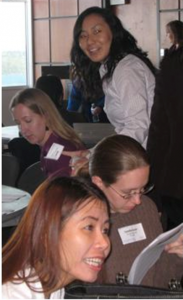 March 2009 UCSF NCCCP Student Leaders Steve Atallah and Jiana Tam produce student-focused program on clinical pearls for managing anticoagulation in response to Joint Commission implementing National Patient Safety Goal 3. Speakers included Dr. Bill Dager (inpatient pearls) and Dr. Steve Kayser (outpatient pearls), and roundtable discussions facilitated by UCSF P4 students who had completed a rotation in the SFGH Anticoagulation Clinic. 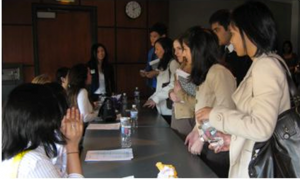 The 120 attendees included students from all schools of pharmacy in Northern California. Funded in part by ASSP. October 2009 UCSF NCCCP Student Leaders Gloria Cheng, Vicky Law, and Priya Gopinath collaborate with NCCCP Student Leaders from other schools to produce a Stroke Quiz Poster for use at health fairs. October 2009 UOP and UCSF Student Leaders Steve Atallah and Jianna Tam jointly create and present a poster at the ACCP Annual meeting in Anaheim describing how each NCCCP Student organization is structured and supported on their respective campuses. Steve Atallah led this multi-school group project. 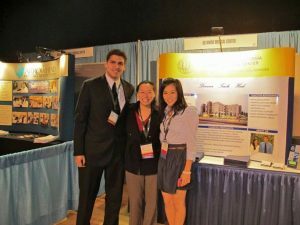 October 2009 UCSF Student Leaders Christine Bang and Steve Atallah served as speakers for the ACCP Faculty Liaisons Committee at the ACCP Annual Meeting in Anaheim, describing ACCP/NCCCP student member activities on their campus. Summer 2010 UCSF NCCCP Student Leader and ACCP Student Liaison for UCSF, Steve Atallah, organized two teams from UCSF (Davis site and SouthBay site) to compete in ACCP’s first Clinical Pharmacy Challenge for students. January 2011 UCSF NCCCP Student Leaders Caroline Chow, Jennifer Samore and Mohsen Shamai collaborate with UCSF CSHP to produce annual Residency 101 Talk with UCSF Pharmacy Residency Director, Cathi Dennehy. UCSF NCCCP Student Leaders obtained and distributed copies of the ACCP Residency Directory to each student participant at this event. April 2011 UCSF NCCCP Residency Panel Discussion. This was an entirely student-driven program. UCSF NCCCP Student Leaders obtained and distributed copies of the ACCP Residency Directory to each student participant at this event. March 2012 UCSF NCCCP Residency Panel Discussion. This was an entirely student-driven program. UOP NCCCP student members were invited to attend, also. UCSF NCCCP Student Leaders obtained and distributed copies of the ACCP Residency Directory to each student participant at this event. October 2012 UCSF NCCCP Student Leaders provided staffing support for the CE event at Marin General on non-VKA oral anticoagulant usage and safety, and assisted in grading post-tests and processing program evaluations. 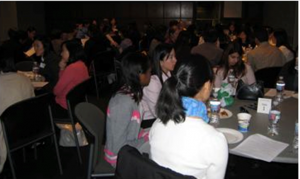 December 2012 NCCCP at UCSF hosted an Inter-Professional Lunch Talk at UCSF: “Stroke Management and Prevention” More than 100 medical, dental, pharmacy, and nursing students attended. The program was supported by The Chancellor’s Endowment Fund. 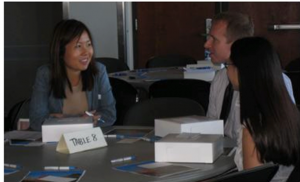 January 2012, UCSF NCCCP Student Leaders provided staffing support for the CE event at Marin General: “How Community Pharmacist can Promote Improved Stroke Outcomes” by assisting with registration and grading post-tests. February 2015 Recognized and funded by Associated Students of the School of Pharmacy (ASSP), the UCSF student government, led by Elizabeth Staub and Collin Yu.